People want different things from their motorhome holidays and to save you money we have many features already included in your basic hire cost. 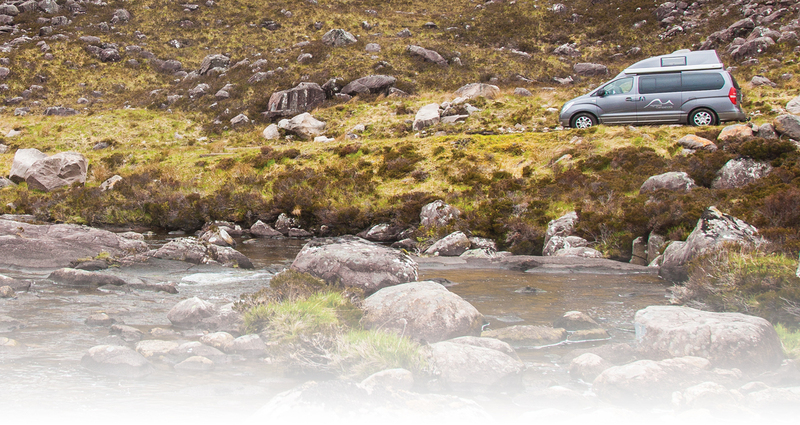 We also have a range of optional extras that you can add to your booking for that extra convenience. Our knowledge! We will gladly help you with information and top tips to plan your trip. Questions, however small or silly you think they are, are unlimited and we are only too happy to help you get the most out of your motorhome holiday! Cleaning accessories pack – Washing up liquid, cleaning spray, hand soap, cloths, kitchen roll, toilet roll and Organic Elsan toilet chemical for your cassette toilet. Child accessories – We have a range of child seats, booster seats and accessories we will include free of charge, please just get in touch. Small low level coffee table for use outside to picnic and relax! A larger dining table available as an optional extra. Parking at our base is free of charge, we are unable to accept responsibility for customers vehicles whilst on site. Insurance for one driver between 21-79 years of age with a clean driving licence and driving history is provided as standard. Insurance premiums may apply to drivers with points or other offences on their licences. Drivers outside of the age brackets should contact us to discuss insurance options. If you order bedding we provide duvets, sheets and pillows. Our John Lewis duvet sets are good quality so you will be cosy and warm! We can provide sleeping bags if you prefer. Travelling with children? Please give us a call to see how we can help you plan ahead. We have a selection of car seats available depending upon your child's age but if you would prefer to use your own seat this is not a problem. Please note that the vehicles are not equipped for ISOFIX child seats. Pre Loaded Fridge - For most people, the thought of starting a holiday with a trip to a busy supermarket isn't particularly appealing, so why not let us pre-load your fridge and cupboards for you? You place your online order with Tesco, Asda or Sainsburys and we will put your shopping in the van for you. You must pay the total cost of the order yourself, online, when you order it. The delivery must be sent to our business address and a time selected of between 10-12am on the day you collect your vehicle. You must tell us that you've placed an order, or else we won't know it's arriving and which van it needs to go in. Although there is a fridge and cupboard space, Scotland does have plenty of farm shops and independent food stores, so you will be able to top-up your groceries during your trip. Please be aware that the fridge space is not like home! Do not order large containers or a shop so big that we may not be able to fit it into the van. 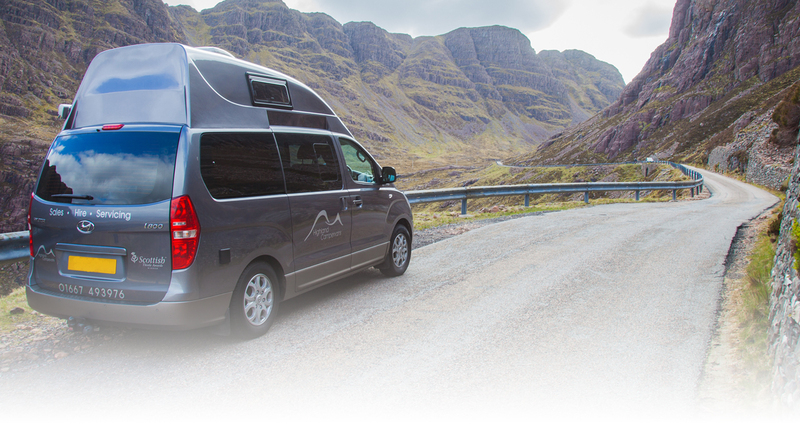 Highland Campervans accepts no responsibility for any products supplied through online supermarket orders which may be damaged, incorrect, substituted or missing. We are a small family firm and whilst we will try to collect and drop you off personally whenever possible, there may be occasions when we are unable to return customers to the town centre. In these instances we will use a local taxi firm. Should you wish to use a local taxi firm for your transfers instead of our service you can get a quote from Sneckie Taxis 01463 611111 or Inverness City Taxi 01463 222555. There is also a public bus service that runs past our base, it is the bus route No11, please be advised that the stop is not directly outside our base. The standard Damage Excess deposit is £1000 (£1500 for ages 21-23 & 76-79). By paying a £22 per day premium you can bring the excess down to £200 (on one incident only) this includes damage to windscreens and tyres. You can research and obtain your own insurance excess reducer with a 3rd party company should you not wish to take ours. Highland Campervans is proud to support 'Trees for Life', a local charity working hard to replant the native Caledonian Pine forests. 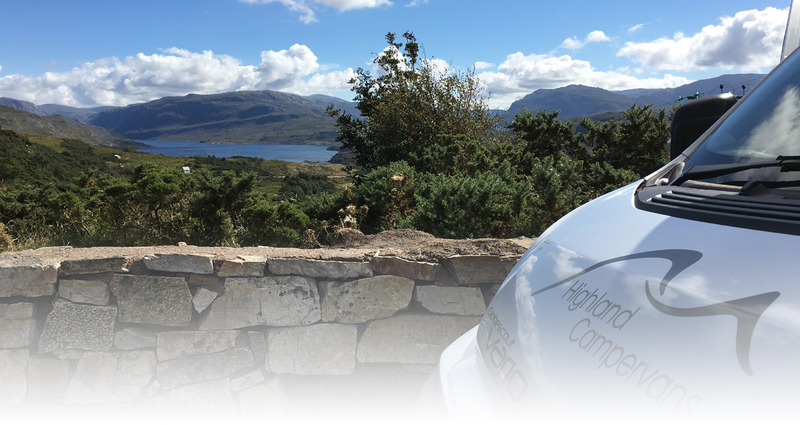 Highland Campervans sponsors a company grove and in addition to the donation we make yearly, customers can help support this charity by making a donation to plant a tree, supporting the beautiful Scottish environment they travel through in a campervan.